The topics discussed here are very simple changes to your webpages, which when combined, have a notable impact on how your website is treated by search engines. Here is what matters most, and why. It all starts with this, even though it is not exposed to users. It is the term that people search for, in order to arrive at a website. You first need to identify the keywords which are both, relevant to what you offer, and are likely to bring you traffic. Keywords of a page are different from keywords of another page, because each page has its own focus terms. Identifying keywords is the most important task of them all, because the title, description and URL of that page depend on, and contain the keywords. The more specific your keywords are, the better. For example,if you own a bakery in Seattle, and specialize in muffins, then Muffins in Seattle is a better option than Cakes. Users are more likely to click on a search result that contains the term they just searched for. That is why the title and description draw attention if when contain these keywords. The title of your page is enclosed in <title> tags, and is exposed as marked in the image above. There are some guidelines an optimum title would always follow. 1. Uniqueness – No two pages of your website should have the same title. 2. Readability – It should be a meaningful sentence, long enough (preferably 65 characters), and is not spammy. 3. 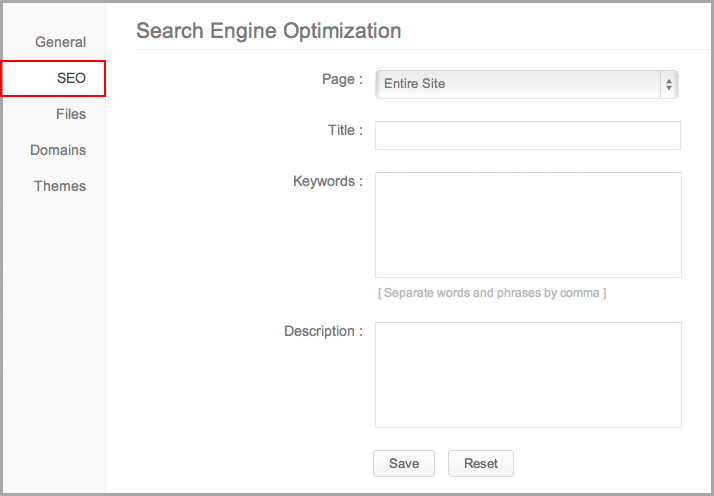 Keyword – The title should contain the keyword which that page focuses on. The sooner it appears in the title, the better. Description appears below the title on search results, and should support the claim you’ve made in your title. 1. Preferably 160 characters long. 2. Should also contain the keyword focused on that page. 4. Should sum up the content on the entire page. 3. Use specific keywords like home.html, contact.html, etc. instead of generic ones like page1.html, page2.html, etc. It is best to have only one H1 heading tag per page, which should contain the same keyword used in title and description tags. All these are enclosed in meta tags like <title>, <description>, etc. If you are managing your own HTML files on Zoho Sites, you are probably familiar with these tags. 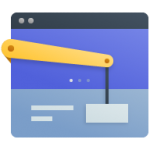 Otherwise, if you are using the drag-and-drop builder, things are even easier. 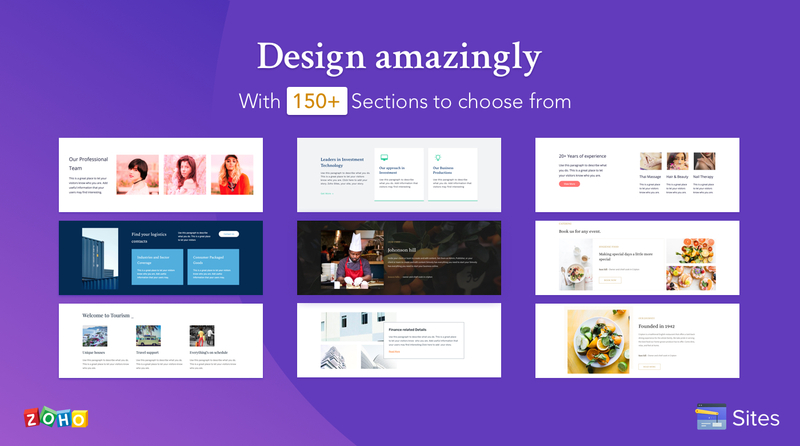 Zoho Sites lets you enter meta details for every page on your site. In the Settings page, you have SEO options. Pick the page from the list, and enter the meta details for that page. Once done, save the changes, and pick another page to optimize. In addition to these meta information, there is another essential optimization technique, but that happens automatically on Zoho Sites; the sitemap. For every website published, Zoho Sites automatically generates the sitemap.xml file. A sitemap helps search engines to identify the entire structure of your website, so that no page goes unnoticed. It also helps in identifying the navigation path to every page. All the above parameters focus only on the text on a webpage. There are numerous other techniques to drive more traffic into your website, which we will gradually get into. Try optimizing your web pages by filling these parameters, and see how it affects your site’s ranking on search engines. Same question as Pippa. DOes anyone answer these things? My site builder does not look like this at all. Has there been an update and no update of the instructions? I’m puzzled by the whole SEO thing the way that it looks on my screen at present. 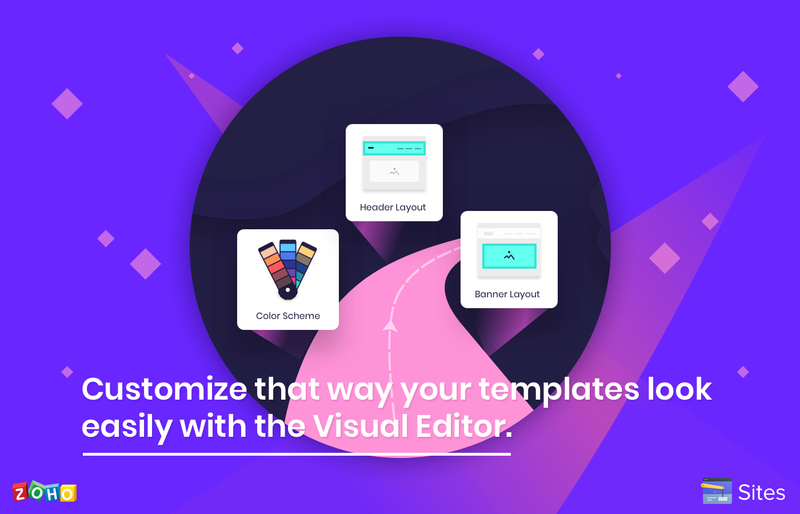 Need to customize your template?Let the Visual Editor do it for you!